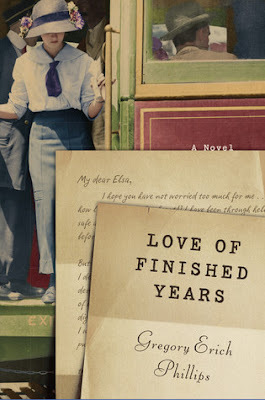 Be sure to read MK French's review of Love of Finished Years. She'll be reviewing his upcoming novel The Exile in April. 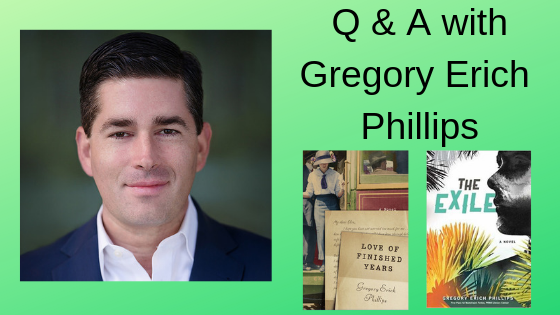 For now, enjoy thi interview with Gregory Erich Phillips. Q: When did you start writing and why were you drawn to the craft? GP: I come from a literary family, so you could say writing was in my blood. My father is a novelist and frequently there were plot brainstorming sessions at the dinner table. I wrote my first novel when I was 14 and have been writing ever since. Many aspiring writers find it is difficult to complete their first book. For me, it was the opposite. I was too young to know that it was supposed to be hard. I watched my dad do it and figured I could too. That memory has continued to inspire me at times when I am stuck in a story, or get too busy and feel like I will never finish the book I’m working on. As to the second part of your question, I was drawn to the craft because there is nothing more powerful than a story. When a reader is absorbed in a novel, the character’s experiences can, at an emotional level, become the reader’s own experiences. For this reason, reading fiction can broaden one’s outlook on the world and humanity, fostering greater understanding and empathy. Non-fiction speaks to readers’ heads, while fiction speaks to their hearts. Thus, I truly believe in fiction as an instrument that can change the world. Q: How do you make time to write? Do you have a specific place where you write or time of day? GP: Early mornings are my best writing time. I find that my mind is fresh and alert. I have committed to the routine of waking up early, giving me a couple of hours to write before I start my day job. Routine is very important. I know some writers who write in the evenings. For me it is the morning. Whenever it is, creating that routine and committing to it is the important thing. That’s how a page every day or two becomes a finished novel after a couple of years. There are days when I’m not feeling especially inspired, but I still stick to my routine, using those early morning hours to think about my project and be present with my characters. That often has as much value as actually putting words on the page. Q: Your first book was Love of Finished Years, a historical novel about WWI. When did you write the book and why was WWI a time period of interest? GP: I originally write Love of Finished Years in 2002-03. Then I re-wrote it in 2012 and that newer version was the one that eventually got published at the beginning of this year. WWI has always fascinated me and I think it is a world event that is under-covered in literature and cinema, especially when compared with WWII. Growing up, this always made me curious about WWI. I used to ask people what it was all about and never really got a satisfactory answer. It didn’t make sense to me and this inspired me to start studying both the war itself, and the world of that time. WWI truly ended one era of world history and began another. So much of the history of the last century is directly affected by WWI and its aftermath. As I conducted my research for the novel, it amazed me how many parallels there were between that time and our own. We tend to forget now how controversial the United States’ entry into WWI was, and how little many of the people, including the soldiers, understood of what was going on. This novel is about an immigrant family, from a country—Germany—which was considered hostile to the United States. Their experience in the 1910s foreshadows the experience of many immigrants in America today, including the experiences of the protagonist in my upcoming novel. Q: Your books sometimes take place in locales and time periods that are not familiar to you. How do you do your research for your stories? GP: When I am writing a novel, I use art and literature to really immerse myself in the setting. Each of my novels presented a unique challenge. Love of Finished Years is set 100 years ago, so while I have visited many of the streets in New York where it took place, such research is limited. What I did was to read novels written at the time of my story to get a feel for how people really spoke and acted in that time. Studying old photography of the time was also really helpful to give visual cues. My newest novel, The Exile, presented a similar but different challenge. Half of the book is set in Colombia, and while I would love to visit, it hasn’t been practical for me to do so. I read Colombian literature, and studied pictures and videos of the setting. I listened to popular Colombian music, just as I had listened to some of the old pre-WWI music my characters in that novel might have heard. I have interviewed native Colombians. Through these efforts, I was able to engage all my senses to feel the essence of places where I had never been. There was a lot of technical research I did to learn about the setting for each of these novels. That research provided the outline for my settings. The art—written, visual and auditory—provided the color. Q: Love of Finished Years and your new book, The Exile, both feature female protagonists. How do you find writing in a female voice? Why is it interesting for you to portray a female perspective? GP: This may be surprising, but I actually find it easier to write female characters than male characters. I’ve been told that my female characters are realistic and compelling. Throughout my adult life, my closest friends have always been women. I feel I relate to women best, and that I actually understand women better than I do most men. Furthermore, I enjoy seeing a story through a woman’s eyes. So much, historically, has been told through the eyes of men, and that gives us a limited picture of the world. 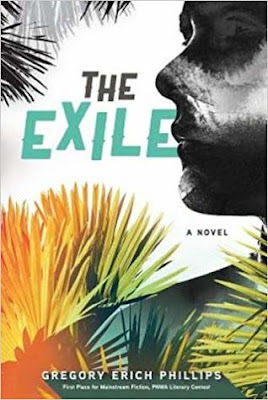 Both these characters, Elsa in Love of Finished Years and Leila in The Exile, are tough women in situations that make each of them a bit of an underdog, not least because they’re both first generation immigrants to the United States. They’re women you want to root for. They’re women that readers really seem to connect with. Q: What is the most difficult aspect of being a writer, in your opinion? GP: When you write novels, you pour your heart and soul into your characters and your story. This is a deeply emotional process. When there are setbacks, it’s hard not to let the emotions get the better of you. It’s hard not to think your books will never be good enough. The process of writing, polishing and publishing a novel takes years. There have been books I’ve spent years on, which I’ve had to let go of. Once you’ve spent so much time and emotion on a project, this can be heartbreaking. Over time, I’ve learned to appreciate it all as part of the process, but I would consider this the most difficult aspect to being a writer. GP: I wrote a novel based on the off-Broadway theatre community in New York. It’s partially drawn from my own experiences dancing in shows off-Broadway and elsewhere. It was a really fun novel to write and I’m currently preparing it up for publication. I’ve also started a draft of another WWI era novel. I’ve learned so much about that time period, I decided to revisit it. Q: You studied dance in college and went on to dance tango professionally. Do you feel that dance and other artistic pursuits in your life enrich your work? How? GP: Dance has been a major part of my life for more than 20 years. It has given me innumerable life experiences and has connected me to wonderful people all over the world. All of my novels, so far, have at least a little bit of dancing in them. But dance has given me much more than this. Through dance, I have developed a varied and multi-cultural circle of friends, and this has impacted my outlook on the world, which comes through clearly in my novels. Partner dancing is a unique way of connecting with other people, of understanding them and allowing them to understand you. When you dance with someone, you have to put yourself out there, so to speak, and allow an intimate connection to happen. All those connections over the years have undoubtedly influenced my writing, helping me to write deeper characters. Q: What are the positive ways writing has impacted your life? GP: For one thing, writing has connected me to such a wonderful community of readers and other writers. I am excited to continue to meet and connect with more people in the coming years who share my passion for books. The deepest way that writing has impacted my life ties back into my answer to your first question. I pointed out how stories can change hearts, increase understanding and empathy, and indeed change the world. If this is true for people who read stories it is equally, if not more, true for those who write them. Writing novels has broadened my perspective in so many ways. It has forced me to reach into the minds of characters who are very different and think very differently from me. It has challenged me to look at situations from all possible angles. In a novel, this outlook allows me to write more compelling scenes and a broader scope of characters. In life, it has allowed me to reach across misunderstandings and grievances, if not always to find common ground, at least to find love. Be sure to enter our current giveaway sponsored by JORD Watches.